The candidate list for the rest of the Lok Sabha constituencies as well as for by-polls to the 18 assembly constituencies in the state shall be announced on March 24 at Coimbatore in Tamil Nadu. Makkal Needhi Maiam (MNM) president Kamal Haasan Wednesday announced the first list of candidates who will be contesting on the ‘Torch Light’ symbol for the upcoming Lok Sabha Elections. The candidate list for the rest of the Lok Sabha constituencies as well as for bypolls to the 18 assembly constituencies in the state shall be announced on March 24 at Coimbatore in Tamil Nadu. 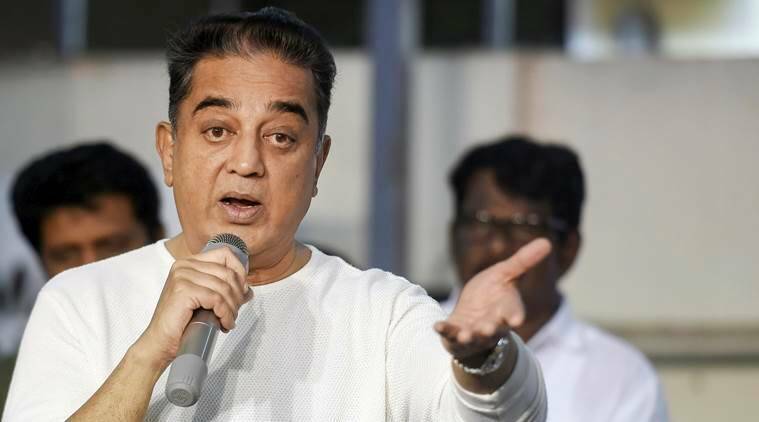 While releasing the list of candidates, Haasan said veteran actor Nassar’s wife, Kameela Nassar, will contest from Chennai Central, whereas retired IPS officer A G Mourya would be contesting from North Chennai constituency, Dr. M Loganathan will contest from Thiruvallur (R) and Dalit Munnetra Kazhagam’s Anbin Poyyamozhi has been allocated Villupuram constituency. “The initial list consists of people who are not money-minded and are interested only in social service,” Haasan said. MNM’s initial list of candidates comprises three doctors, a retired District Judge and a retired IPS officer. Haasan added that some key names will pop-up in the next list which is scheduled to be released on March 24th. In a quirky remark directed at the political heirs of the Dravidian parties, he said, “Earlier, it used to be the land of the ‘Rising Sun’, now it is the land of the ‘Rising Son'”. Haasan also termed as “baseless” the charges made by C K Kumaravel, a senior leader who quit the party on Monday citing the party is affected by internal politics. “His (Kumaravel) allegations are baseless and he is the only one in the party who is saying that there is internal politics, whereas rest of the party members are happy with the way we operate. We took disciplinary against him because he acted against the party’s norm. Had he not submitted his resignation, we would have sacked him,” he added. The party, which has already sealed a pact with the Republican Party of India (RPI), has hinted at a move to align with a few more parties ahead of the Lok Sabha elections. RPI president and former MLA C K Tamilarasan said that the collaboration is for the welfare of Tamil Nadu and promised to support MNM in bypolls as well. Other leaders that MNM has fielded includes M Sivakumar for Sriperambudur, N Rajendran for Arakonam, R Suresh for Vellore, R SriKarunya for Krishnagiri, D Rajasekhar for Dharmapuri, M Prabhu Manikandan for Salem, Rajendran for Nilgiris, Dr S Sudhakar for Dindigul, V Ananda Raja for Trichy, T Ravi for Chidambaram, M Rifayudeen for Mayiladuthurai, K Guruviah for Nagapattinam (R), S Radhakrishnan for Theni, T P S Pon Kumaran for Thoothukudi, M Vennimalai for Tirunelveli, J Ebenezer for Kanyakumari and Dr M A S Subramanian for Puducherry constituencies, respectively.